The Dwacon® Blog: C.Ken ??? With Senator Hillary Clinton slated to become the next Secretary of State, there has been a lot of speculation regarding who should take her seat in the Senate. There are many who feel that JFK’s daughter Caroline would be a perfect choice. Unfortunately, New York Congressman Gary Ackerman feels that Caroline’s only qualification is that she has the name recognition of Jennifer Lopez. So, in other words, C.Ken is another J.Lo? Read more about it in The New York Post. And regarding the previous post: Am I the only one who doesn't recognize Jennifer Anniston? Just doesn't look like her at all to me. 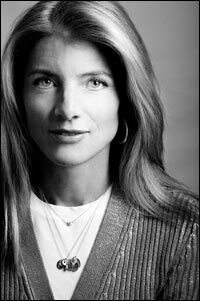 Caroline Kennedy is probably as well prepared to be a senator as any first term senator who has run. Maybe even more, because of her unique pedigree to the political arena.